We online entrepreneurs all know that some countries of the world are restricted by PayPal, reasons best known to them. Unfortunately, Nigeria was among the restricted countries by PayPal until 2014 when PayPal allowed Nigeria to open an account, but still, the account has restrictions. The Nigeria PayPal account cannot receive money into it. It can only be used to make payment for goods and services on websites that accept PayPal as a means of payment. So, if you have any reason to receive money online and the means of receiving it is PayPal only, then the Nigeria PayPal account cannot do that for you. What you need is a fully functional verified PayPal account from other countries where PayPal allows their full services, such countries as USA and UAE. This web page will show you how to get such an account right here in Nigeria. This restriction by placed on Nigeria by Paypal was necessitated many years ago when some unscrupulous Nigerians used it to scam and defraud many foreign buyers on eBay. Consequently, PayPal placed a total restriction on Nigeria, no one residing in Nigeria was allowed to open and operate a PayPal account, until 2014 when the part of the restriction was lifted. However, the Nigerian PayPal account can only send funds and make online payments on platforms that accept PayPal. It cannot be used to receive or withdraw funds. Thus, the goal of this web page is to put you through the two methods I’ve tested and used in opening my own fully functional and verified PayPal accounts. I use this account in receiving payments online and to also send money online with no restriction whatsoever. I can open and verify a fully functional PayPal account for you within one week. My services are very affordable. 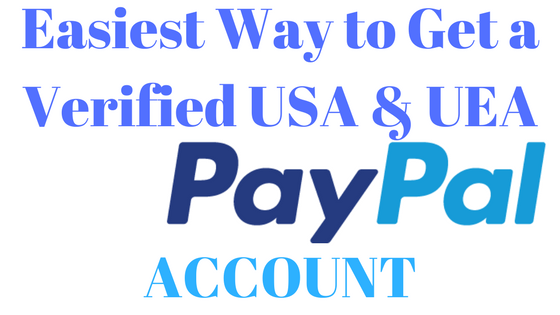 You can check the details of my PayPal account opening and verification services on this page Easiest way to get a fully functional USA and UAE PayPal account right here in Nigeria.